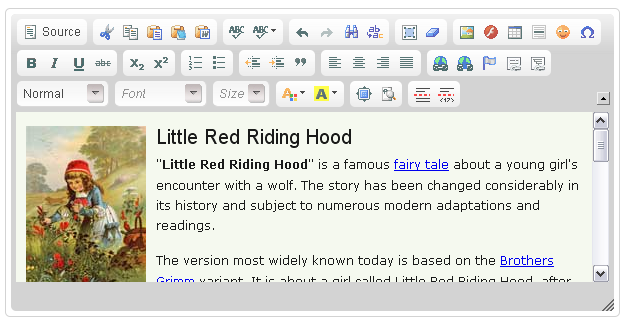 WYSIWYG provides a number of standard editor options including whether the editor is enabled by default, where the editor toolbar should be located and which CSS file should be used to style the editor's contents. Although these options are quite extensive, they are not comprehensive (mostly do to the fact that different editors suport different options). Most editors have a host of variables that can be tweaked to customize everything from blocked keystrokes to button colors. Luckily, WYSIWYG includes a hook specifically designed to modify these settings, hook_wysiwyg_editor_settings_alter. In order to alter non-standard editor options, a custom module can implement hook_wysiwyg_editor_settings_alter. The hook has has two parameters, $settings and $context, which make it simple to change certain editor options depending on the situation. In most cases, you'll want to check $context to ensure that your custom settings are only being applied to your editor of choice. Simply implement hook_wysiwyg_editor_settings_alter in a custom module, check $context to ensure that the settings are only being applied to your desired editor and then add the option and its calue to the $settings array.